I was tired of living uninspired where all my art and creative tools were stashed in the plastic bags I purchased them in and buried one under another. And so I took a weekend, and dedicated myself with the generous help of a friend, to create a space that was mine. I love the magazine “Where Women Create”. It is a publication dedicated to looking into secret offices, barns, sheds, rooms and nooks of the women who create art and put it out in the world. Some are organized in a way that would put Martha Stewart to shame. Some are total and complete chaos to the visitors eye, but it works for the woman who is inspired and works there. As soon as I get my hands on the latest edition, I obsess over it, pour over it, squint my eyes to capture every detail. 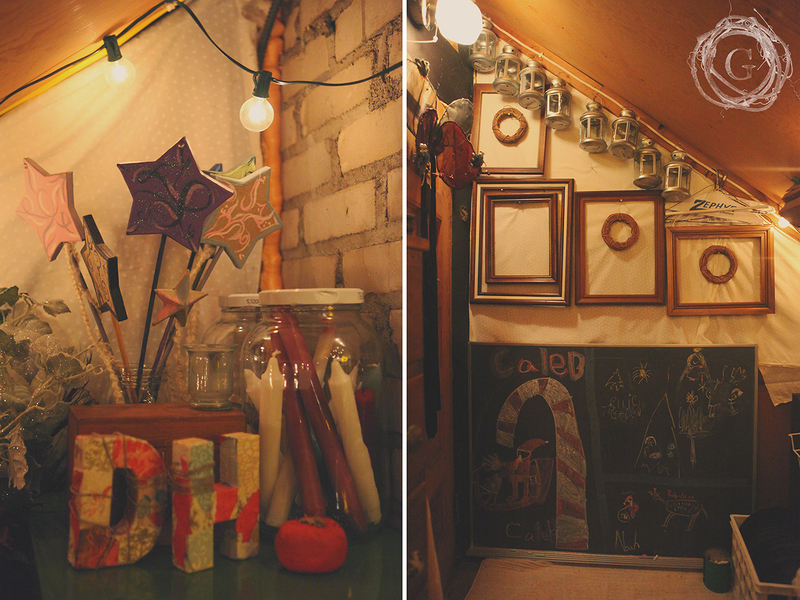 While reading about a woman who turned her garage into a wood carving studio, I was inspired to transform my attic crawl space into my art room. 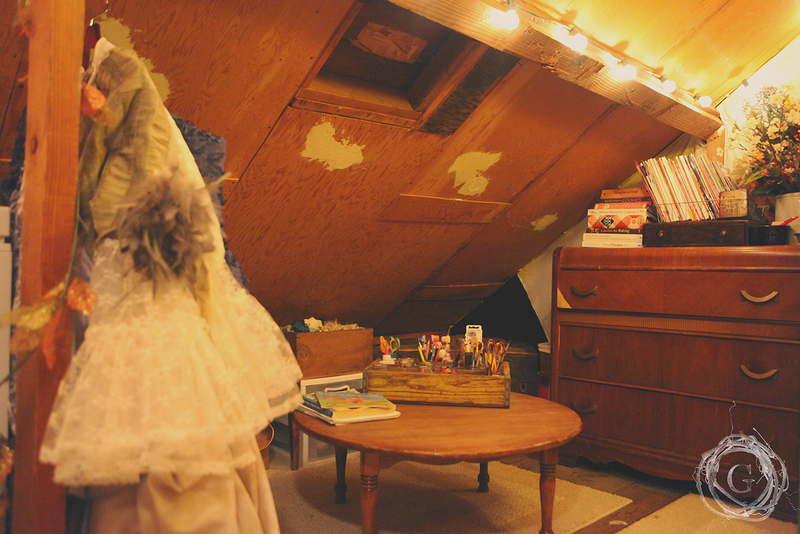 I quickly saw the attic as a space that was all mine…I only had to uncover it and put my creative heart on display. I was creative with storage and used only what I had to decorate. 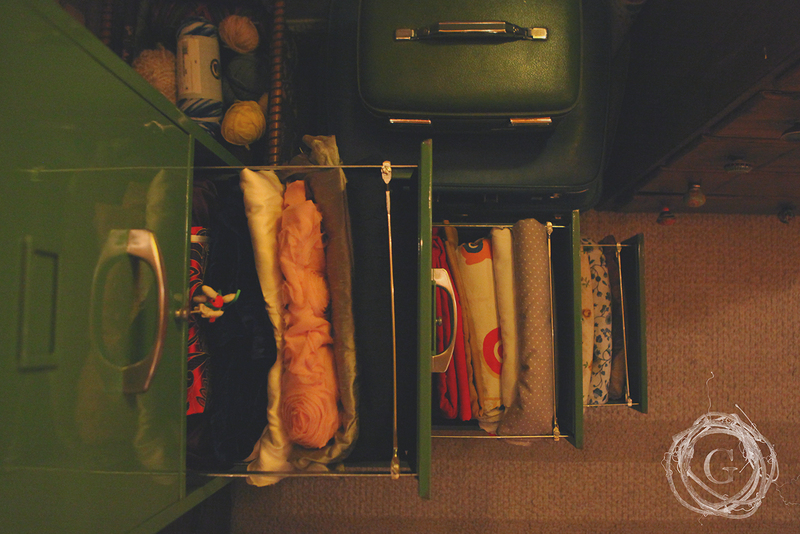 Packing like items together in an old dresser for easy access. Displaying family heirlooms and the family jewels (yes I said it). Instead of simply packing away vintage hat boxes, the hats became wall art and they remind me of an inspired time in history that inspires the fabric and patterns I buy and sew with. I think we miss a treasure when we don’t scour around our own nooks and crannies in our basements and closets and attics. (Yes even that garage attic will hold secrets you didn’t realize you had!) Then you fill your space using inspiration and imagination and all of a sudden, it is easier to turn your pot for herbs into a button stash. Or a file cabinet into storage for fabric. In my opinion the best spaces are filled with things you already have, or created out of materials around your home. 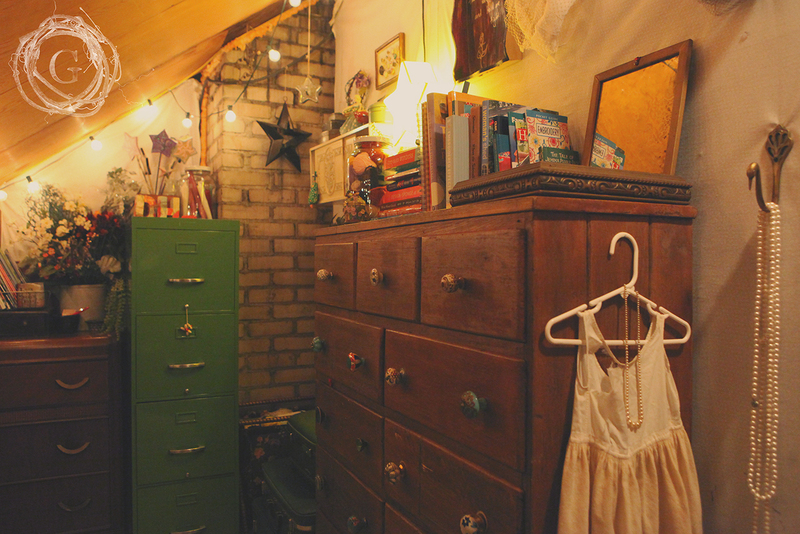 You can easily achieve a lovely DIY space prudently if you let your creativity take charge. And even more when figuring out how to store items…putting special pieces or art tools out on display so they can continue to inspire. Keep painting. Keep doing your metal work or bead work, or designing dolls or throwing pottery, or printing cards. Displaying your work and tools keeps your mind digging deeper, unearthing that soul filled piece you have been waiting your whole awakened life to create. You can’t get there if you don’t take the steps before hand, the steps that feel awkward and unstable. You can’t paint your life’s work in one painting, and you will paint 100 bad images before you find the one in you that has been waiting to be revealed. I would be remiss though if I didn’t at least carve out a little space for my children to enjoy the magic of a creative and inspired space. If I want them to catch the muse and find their voice in art, I must allow them a space to play and get their hands dirty. So they have a whole drawer and table and chalk board in my room. They are welcome here because everyone should have a place where there are no rules, and your spirit is free to find the truth inside. You may be like me and lack an actual size room to turn into your own space, be creative. Think outside the box. Find a corner or a wall or a closet, or half the garage or basement. Unearth that creative spirit and see where it will take you! You are so creative. I like your idea of having a special space and keeping materials at hand. A special space that you do not always have to clean up and put away each time. Thank you! It is fun to finally have a little creative space to call my own. I hope you can carve out your own space too!